The world's first quartz clock was built in 1927 by Warren Marrison and J. W. Horton at Bell Telephone Laboratories. The world's first quartz watch, however, was unveiled by Seiko as the Astron in December 1969. Since the 1980s, when the advent of solid-state digital electronics allowed them to be made compact and inexpensive, quartz timekeepers have become the world's most widely used timekeeping technology, used in most clocks and watches, as well as computers and other appliances that keep time. Chemically, quartz is a specific form of a compound called silicon dioxide. Many materials can be formed into plates that will resonate. However, quartz is also a piezoelectric material: that is, when a quartz crystal is subject to mechanical stress, such as bending, it accumulates electrical charge across some planes. In a reverse effect, if charges are placed across the crystal plane, quartz crystals will bend. Since quartz can be directly driven (to flex) by an electric signal, no additional transducer is required to use it in a resonator. 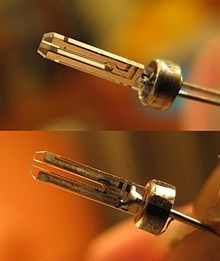 Similar crystals are used in low-end phonograph cartridges: The movement of the stylus (needle) flexes a quartz crystal, which produces a small voltage, which is amplified and played through speakers. Quartz microphones are still available, though not common. Quartz has a further advantage in that its size does not change much as temperature fluctuates. Fused quartz is often used for laboratory equipment that must not change shape along with the temperature. A quartz plate's resonance frequency, based on its size, will not significantly rise or fall. Similarly, since its resonator does not change shape, a quartz clock will remain relatively accurate as the temperature changes. In the early 20th century, radio engineers sought a precise, stable source of radio frequencies and started at first with steel resonators. However, when Walter Guyton Cady found that quartz can resonate with less equipment and better temperature stability, steel resonators disappeared within a few years. Later, scientists at NIST (then the U.S. National Bureau of Standards) discovered that a crystal oscillator could be more accurate than a pendulum clock. The electronic circuit is an oscillator, an amplifier whose output passes through the quartz resonator. The resonator acts as an electronic filter, eliminating all but the single frequency of interest. The output of the resonator feeds back to the input of the amplifier, and the resonator assures that the oscillator "howls" with the exact frequency of interest. When the circuit starts up, even a single shot can cascade to bringing the oscillator to the desired frequency. If the amplifier is too perfect, the oscillator will not start. The frequency at which the crystal oscillates depends on its shape, size, and the crystal plane on which the quartz is cut. The positions at which electrodes are placed can slightly change the tuning as well. If the crystal is accurately shaped and positioned, it will oscillate at a desired frequency. In nearly all quartz watches, the frequency is 7004327680000000000♠32768 Hz, and the crystal is cut in a small tuning fork shape on a particular crystal plane. This frequency is a power of two (7004327680000000000♠32768 = 215), just high enough so most people cannot hear it, yet low enough to permit inexpensive counters to derive a 1-second pulse. A 15-bit binary digital counter driven by the frequency will overflow once per second, creating a digital pulse once per second. The pulse-per-second output can be used to drive many kinds of clocks. Although quartz has a very low coefficient of thermal expansion, temperature changes are the major cause of frequency variation in crystal oscillators. The most obvious way of reducing the effect of temperature on oscillation rate is to keep the crystal at a constant temperature. For laboratory-grade oscillators an oven-controlled crystal oscillator is used, in which the crystal is kept in a very small oven that is held at a constant temperature. This method is, however, impractical for consumer quartz clock and wrist-watch movements. The crystal planes and tuning of a consumer-grade clock crystal are designed for minimal temperature sensitivity in terms of their effect on frequency and operate best at about 25 to 28 °C (77 to 82 °F). At that temperature the crystal oscillates at its fastest. A higher or lower temperature will result in a −0.035 ppm/°C2 (slower) oscillation rate. So a ±1 °C temperature deviation will account for a (±1)2 × −0.035 ppm = −0.035 ppm rate change, which is equivalent to −1.1 seconds per year. If, instead, the crystal experiences a ±10 °C temperature deviation, then the rate change will be (±10)2 × −0.035 ppm = −3.5 ppm, which is equivalent to −110 seconds per year. Quartz watch manufacturers use a simplified version of the oven-controlled crystal oscillator method by recommending that their watches be worn regularly to ensure best performance. Regular wearing of a quartz watch significantly reduces the magnitude of environmental temperature swings, since a correctly designed watch case forms an expedient crystal oven that uses the stable temperature of the human body to keep the crystal in its most accurate temperature range. Basic quartz wristwatch movement. Bottom right: quartz crystal oscillator, left: button cell watch battery, top right: oscillator counter, top left: the coil of the stepper motor that powers the watch hands. Picture of a quartz crystal resonator, used as the timekeeping component in quartz watches and clocks, with the case removed. It is formed in the shape of a tuning fork. Most such quartz clock crystals vibrate at a frequency of 7004327680000000000♠32768 Hz. In modern quartz clocks, the quartz crystal resonator or oscillator is in the shape of a small tuning fork (XY-cut), laser-trimmed or precision lapped to vibrate at 7004327680000000000♠32768 Hz. This frequency is equal to 215 cycles per second. A power of 2 is chosen so a simple chain of digital divide-by-2 stages can derive the 1 Hz signal needed to drive the watch's second hand. In most clocks, the resonator is in a small can or flat package, about 4 mm long. The 7004327680000000000♠32768 Hz resonator has become so common due to a compromise between the large physical size of low-frequency crystals for watches and the large current drain of high-frequency crystals, which reduces the life of the watch battery. 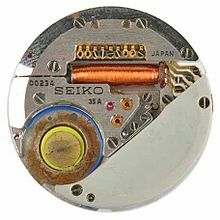 During the 1970s, the introduction of metal–oxide–semiconductor (MOS) integrated circuits allowed a 12-month battery life from a single coin cell when driving either a mechanical Lavet-type stepping motor or a liquid-crystal display (in an LCD digital watch). Light-emitting diode (LED) displays for watches have become rare due to their comparatively high battery consumption. A cantilever made of quartz (E = 1011 N/m2 = 100 GPa and ρ = 2634 kg/m3) with a length of 3 mm and a thickness of 0.3 mm has thus a fundamental frequency around 33 kHz. The crystal is tuned to exactly 215 = 7004327680000000000♠32768 Hz or runs at a slightly higher frequency with inhibition compensation (see below). The relative stability of the quartz resonator and its driving circuit is much better than its absolute accuracy. Standard-quality 32,768 Hz resonators of this type are warranted to have a long-term accuracy of about six parts per million (0.0006%) at 31 °C (87.8 °F): that is, a typical quartz clock or wristwatch will gain or lose 15 seconds per 30 days (within a normal temperature range of 5 to 35 °C (41 to 95 °F)) or less than a half second clock drift per day when worn near the body. Many inexpensive quartz clocks and watches use a technique known as inhibition compensation. The crystal is deliberately made to run somewhat faster. After manufacturing, each module is calibrated against a precision clock at the factory and adjusted to keep accurate time by programming the digital logic to skip a small number of crystal cycles at regular intervals, such as 10 seconds or 1 minute. For a typical quartz movement this allows programmed adjustments in 7.91 seconds per 30 days increments for 10-second intervals (on a 10-second measurement gate) or programmed adjustments in 1.32 seconds per 30 days increments for 60-second intervals (on a 60-second measurement gate). The advantage of this method is that using digital programming to store the number of pulses to suppress in a non-volatile memory register on the chip is less expensive than the older technique of trimming the quartz tuning-fork frequency. The inhibition-compensation logic of some quartz movements can be regulated by service centers with the help of a precision timer and adjustment terminal after leaving the factory, though many inexpensive quartz watch movements do not offer this functionality. Some premium movement designs self-rate and self-regulate. That is, rather than just counting vibrations, their computer program takes the simple count and scales it using a ratio calculated between an epoch set at the factory, and the most recent time the clock was set. These clocks become more accurate as they age. It is possible for a computerized high-accuracy quartz movement to measure its temperature and adjust for that as well. Both analog and digital temperature compensation have been used in high-end quartz watches. In more expensive high-end quartz watches, thermal compensation can be implemented by varying the number of cycles to inhibit depending on the output from a temperature sensor. The COSC average daily rate standard for officially certified COSC quartz chronometers is ±25.55 seconds per year. Thermocompensated quartz movements, even in wrist watches, can be accurate to within ±5 to ±25 seconds per year and can be used as marine chronometers to determine longitude by means of celestial navigation. In 2018 Citizen announced it developed the Caliber 0100 Eco-Drive prototype autonomous high-accuracy quartz watch movement which is claimed to be accurate to ±1 second per year. Key elements to obtain the high claimed accuracy are applying a for a watch unusual shaped (AT-cut) quartz crystal operated at 223 = 7006838860800000000♠8388608 Hz frequency and thermal compensation. The Caliber 0100 movement will not be available for sale to the public; the technology inside the movement will be introduced in future models, set to launch in 2019. 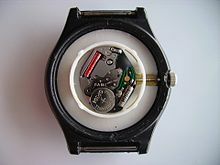 If a quartz movement is "rated" by measuring its timekeeping characteristics against a radio clock's time broadcast, to determine how much time the watch gains or loses per day, and adjustments are made to the circuitry to "regulate" the timekeeping, then the corrected time will easily be accurate within ±10 seconds per year. This is more than adequate to perform celestial navigation. Quartz chronometers designed as time standards often include a crystal oven, to keep the crystal at a constant temperature. Some self-rate and include "crystal farms", so that the clock can take the average of a set of time measurements. Four precision 100 kHz quartz oscillators at the US Bureau of Standards (now NIST) that became the first quartz frequency standard for the United States in 1929. Kept in temperature-controlled ovens to prevent frequency drift due to thermal expansion or contraction of the large quartz resonators (mounted under the glass domes on top of the units) they achieved accuracy of 10−7, roughly 1 second error in 4 months. The piezoelectric properties of quartz were discovered by Jacques and Pierre Curie in 1880. The first quartz crystal oscillator was built by Walter G. Cady in 1921. In 1923, D. W. Dye at the National Physical Laboratory in the UK and Warren Marrison at Bell Telephone Laboratories produced sequences of precision time signals with quartz oscillators. In 1927, the first quartz clock was built by Warren Marrison and J. W. Horton at Bell Telephone Laboratories. The next 3 decades saw the development of quartz clocks as precision time standards in laboratory settings; the bulky delicate counting electronics, built with vacuum tubes, limited their use elsewhere. In 1932 a quartz clock was able to measure tiny variations in the rotation rate of the Earth over periods as short as a few weeks. In Japan in 1932, Issac Koga developed a crystal cut that gave an oscillation frequency independent of temperature variation. The National Bureau of Standards (now NIST) based the time standard of the US on quartz clocks between the 1930s and the 1960s, after which it transitioned to atomic clocks. The wider use of quartz clock technology had to await the development of cheap semiconductor digital logic in the 1960s. The revised 14th edition of Encyclopædia Britannica[when?] stated that quartz clocks would probably never be affordable enough to be used domestically. The world's first prototype analog quartz wristwatches were revealed in 1967: the Beta 1 revealed by the Centre Electronique Horloger (CEH) in Neuchâtel Switzerland, and the prototype of the Astron revealed by Seiko in Japan (Seiko had been working on quartz clocks since 1958). In December 1969, Seiko produced the world's first commercial quartz wristwatch, the Seiko-Quartz Astron 35SQ which is now honored with IEEE Milestone. The Astron had a quartz oscillator with a frequency of 8192 Hz and was accurate to 0.2 seconds per day, 5 seconds per month, or 1 minute per year. The Astron was released less than a year prior to the introduction of the Swiss Beta 21, which was developed by 16 Swiss Watch manufacturers and used by Rolex, Patek and Omega in their electroquartz models. The inherent accuracy and low cost of production has resulted in the proliferation of quartz clocks and watches since that time. By the 1980s, quartz technology had taken over applications such as kitchen timers, alarm clocks, bank vault time locks, and time fuzes on munitions, from earlier mechanical balance wheel movements, an upheaval known in watchmaking as the quartz crisis. Quartz timepieces have dominated the wristwatch and clock market since the 1980s. Because of the high Q factor and low temperature coefficient of the quartz crystal, they are more accurate than the best mechanical timepieces, and the elimination of all moving parts makes them more rugged and eliminates the need for periodic maintenance. Commercial analog and digital wall clocks became available in 2014 that utilize a double oven quartz oscillator, accurate to 0.2 ppb. These clocks are factory-synchronized with the atomic time standard and typically do not require any further time adjustments for the life of the clock. ^ October 10, Joe Thompson; 2017. "Four Revolutions: Part 1: A Concise History Of The Quartz Revolution". HODINKEE. Retrieved 2019-03-03. ^ "The Quartz Crisis and Recovery of Swiss Watches | Relation between Timepieces and Society". THE SEIKO MUSEUM. Retrieved 2019-03-03. ^ a b "The Accuracy and Stability of Quartz Watches" by Michael Lombardi (2008). ^ Whitney, Scott (1999-04-23). "Vibrations of Cantilever Beams: Deflection, Frequency, and Research Uses". University of Nebraska–Lincoln. Retrieved 2011-11-09. ^ "density of quartz". Wolframalpha.com. Retrieved 2010-03-25. ^ Read, Alexander. "High accuracy timepieces that could be used as marine chronometer". Retrieved 2007-09-22. ^ Meier, D. "High Accuracy Wristwatches as Marine Chronometers". Retrieved 2013-04-21. ^ Marrison, W. A.; J. W. Horton (February 1928). "Precision determination of frequency". I. R. E. Proc. 16 (2): 137–154. doi:10.1109/JRPROC.1928.221372. ^ Marrison, Warren (1948). "The Evolution of the Quartz Crystal Clock". Bell System Technical Journal. AT&T. 27 (3): 510–588. doi:10.1002/j.1538-7305.1948.tb01343.x. Archived from the original on 2007-05-13. ^ Marrison Archived 2011-07-17 at the Wayback Machine, 1948. ^ Koga, I., M. Aruga, Y. Yoshinaka, Theory of Plane Elastic Waves in a Piezoelectric Crystalline Medium and Determination of Elastic and Piezoelectric Constants of Quartz, Phys. Rev. March 1958, Volume 109, pp. 1467–1473, doi: 10.1103/PhysRev.109.1467. ^ Issac Koga, Notes on Piezoelectric Quartz Crystals, Proceedings of the Institute of Radio Engineers, March 1936, Volume 24, Issue 3, pp. 510–531, doi: 10.1109/JRPROC.1936.226840. ^ Uchino, K. (2010). Advanced Piezoelectric Materials. Elsevier. p. 174. ISBN 978-1-84569-534-7. ^ Sullivan, D. B. (2001). "Time and frequency measurement at NIST: The first 100 years" (PDF). Time and Frequency Division, National Institute of Standards and Technology. p. 5. ^ a b Carlene Stephens and Maggie Dennis Engineering time: inventing the electronic wristwatch. ^ "From the roots until today's achievements." Federation of the Swiss Watch Industry. Archived from the original on 2007-11-28. Retrieved 2007-12-06. ^ "Seiko Quartz Astron 35SQ December 1969" (PDF). ^ "Milestones: Electronic Quartz Wristwatch, 1969". Cook A (2001). "Time and the Royal Society". Notes and Records of the Royal Society of London. 55 (1): 9–27. doi:10.1098/rsnr.2001.0123. Marrison WA (1948). "The Evolution of the quartz crystal clock". Bell System Technical Journal. 27 (3): 510–588. doi:10.1002/j.1538-7305.1948.tb01343.x. Archived from the original on 2007-05-13. Horology 101 - quartz F.A.Q.